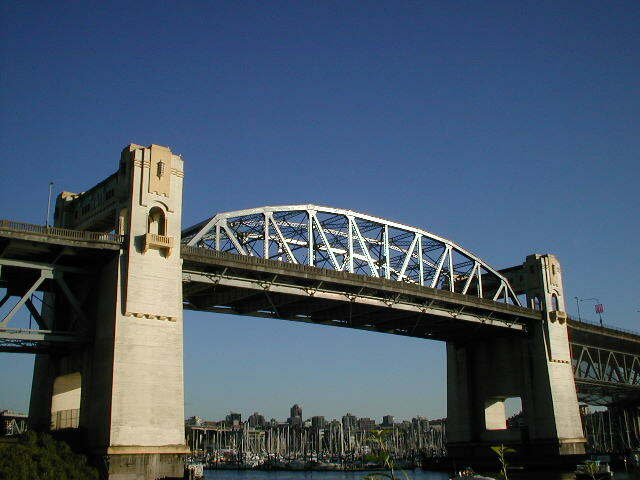 This section of balsabridge.com is used to display photographs of bridges in the greater Vancouver area. 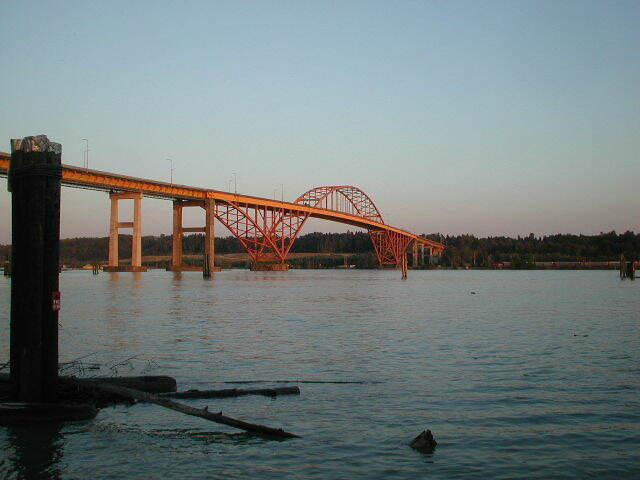 For now the photographs will be randomly displayed. 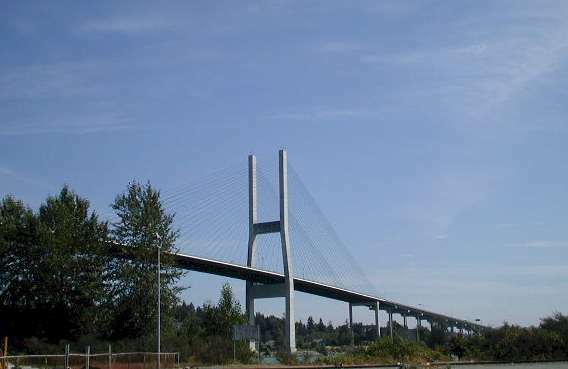 Suitable descriptions and bridge facts will be incorporated later. 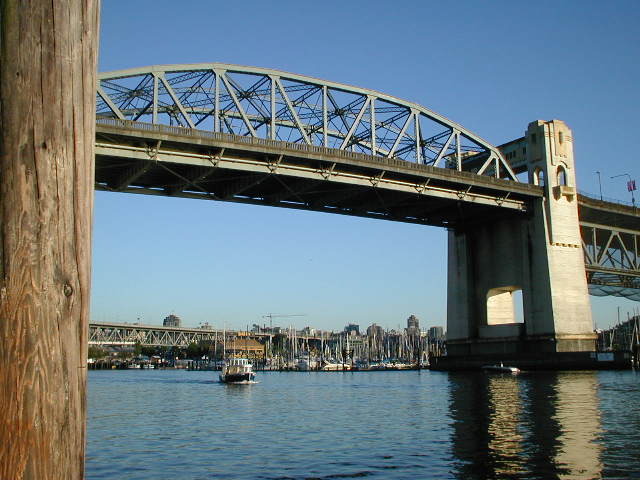 The Vancouver area is graced with many fine bridges. 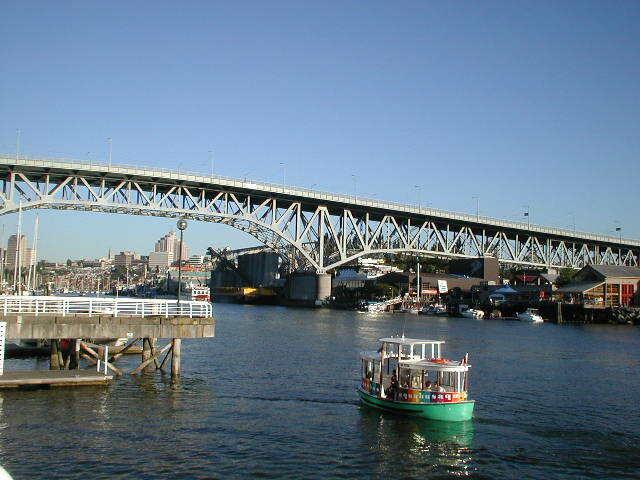 Hopefully these images convey some of that grace. 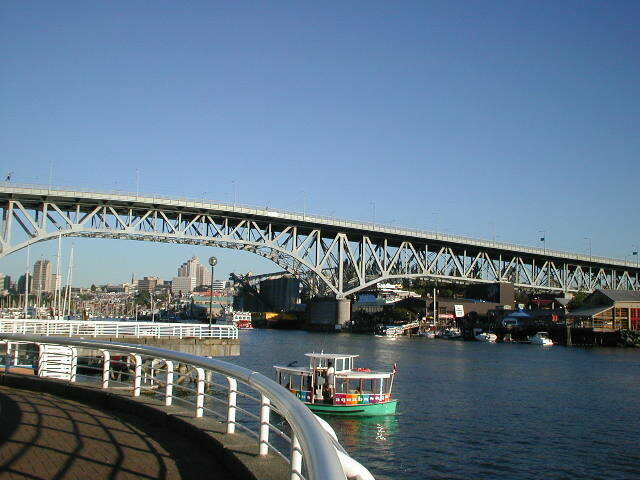 Click on thumbnails to display full-sized images (ca. 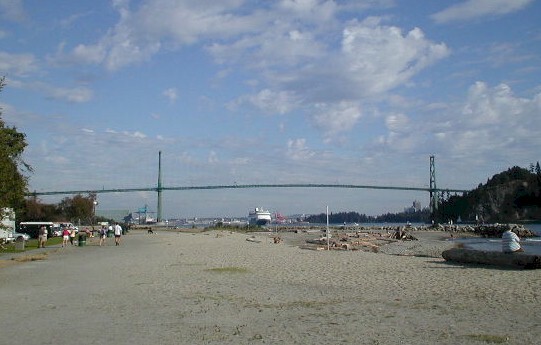 60 k). 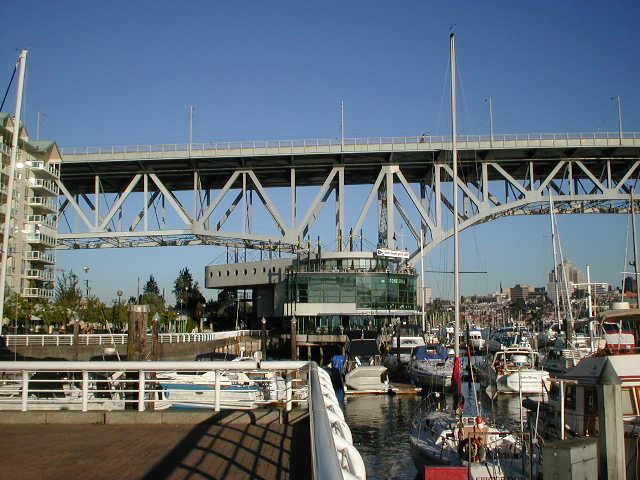 This vehicular bridge "guards" the entrance to False Creek, home to marinas, Granville Island, Science World and numerous restaurants. 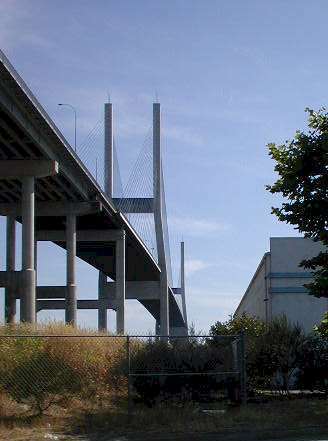 Presently there is debate over dedicating a portion of the bridge to bicycle traffic. 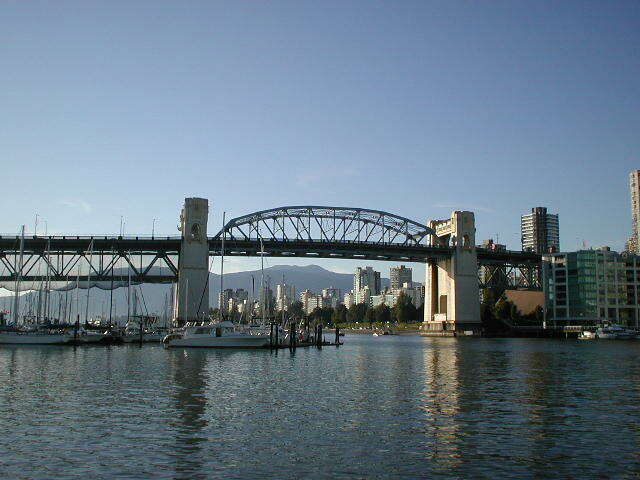 More than a decade ago there was another bridge, just east of the Burrard Street Bridge. 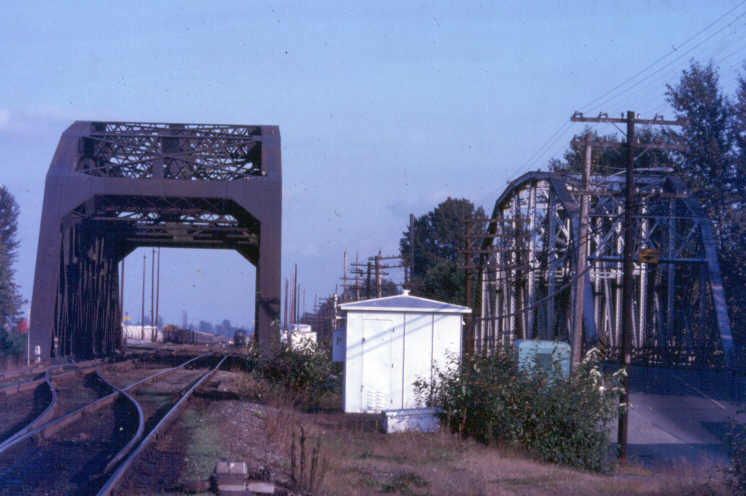 This bridge, the Kerrisdale railway trestle, was torn down. 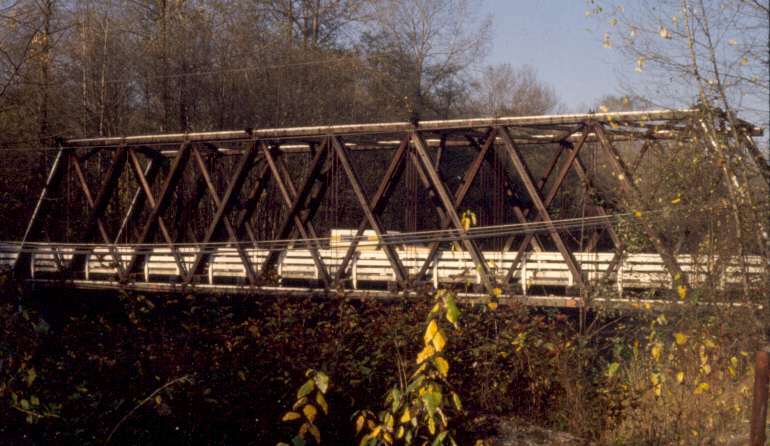 It is to be seen in some of the older photographs on this page. 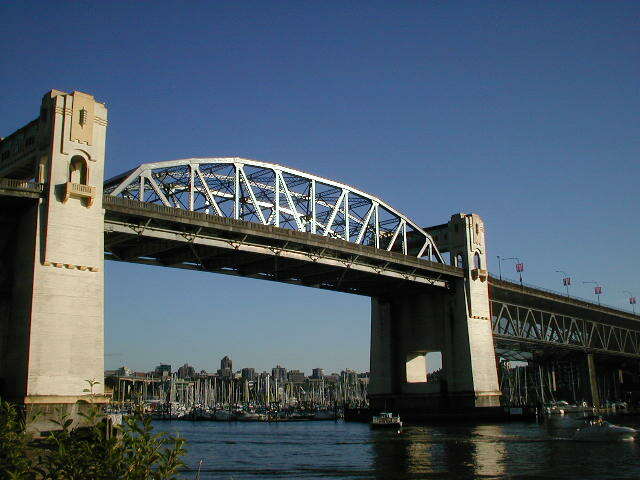 The Granville Street Bridge is one of the major thoroughfares into the downtown peninsula. 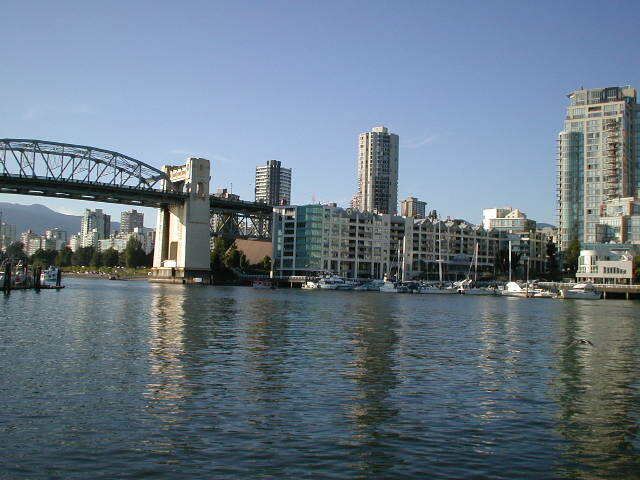 It sweeps across Granville Island and False Creek. 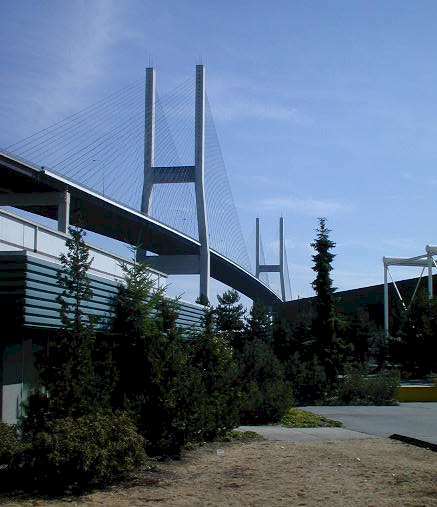 Recent seismic upgrading has secured the trusswork to the supporting pillars. 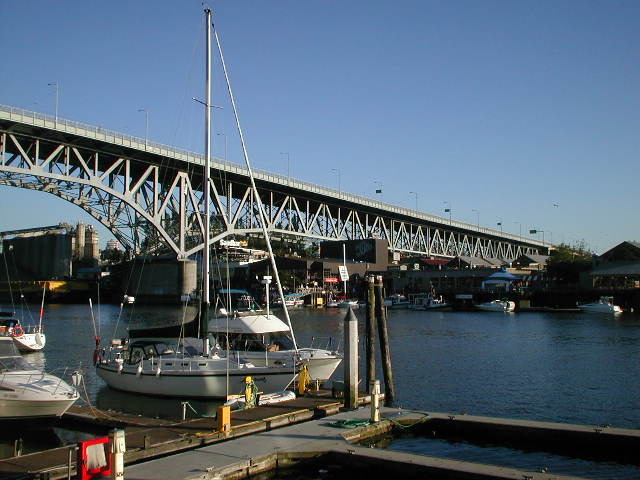 Visitors to the city may not be so enamoured with this bridge if they have to reclaim a vehicle from the city impound lot located beneath the northern approaches. 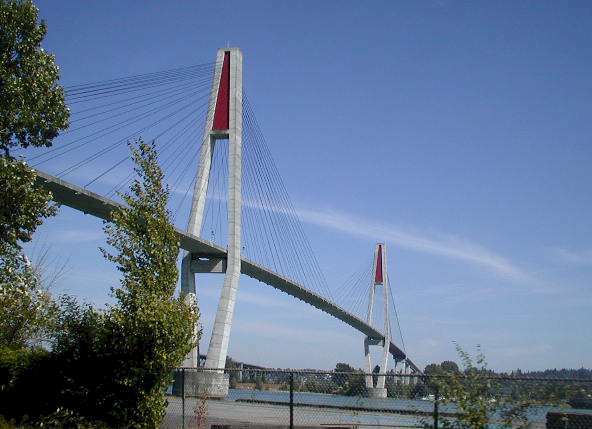 This graceful steel arch, once the third-longest of its kind in the world, carries the Trans-Canada highway across the Fraser River. 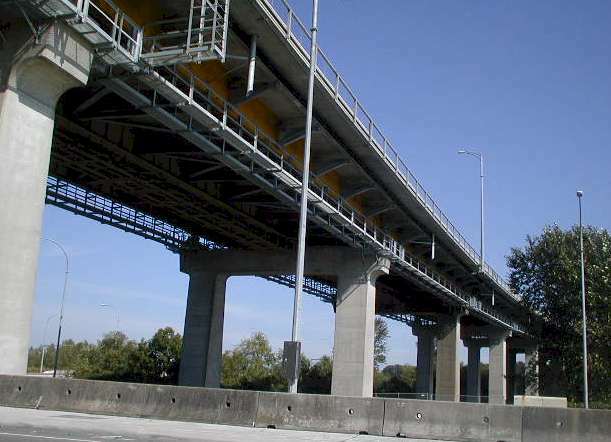 In 2002 its capacity was increased with the addition of an eastbound high occupancy vehicle (HOV) lane, bringing the total to five. 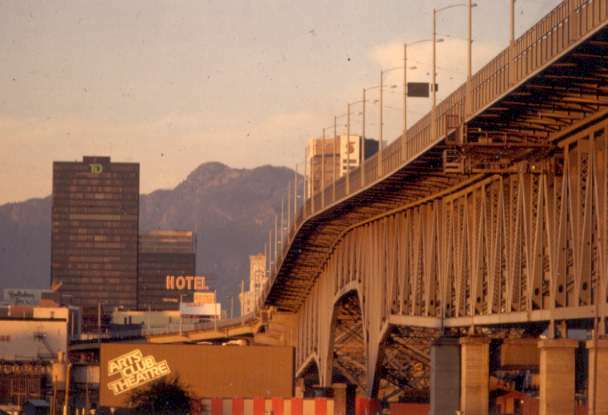 This jewel of Vancouver's bridges is both loved and cursed. 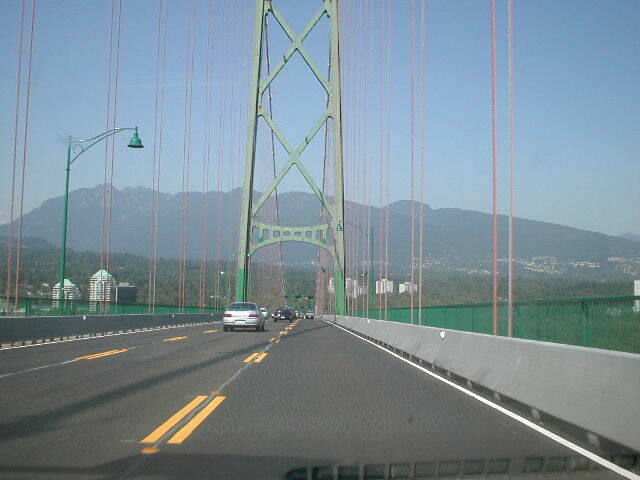 Its three traffic lanes, the centre lane being switchable according to demand, are often said to be an anachronism. 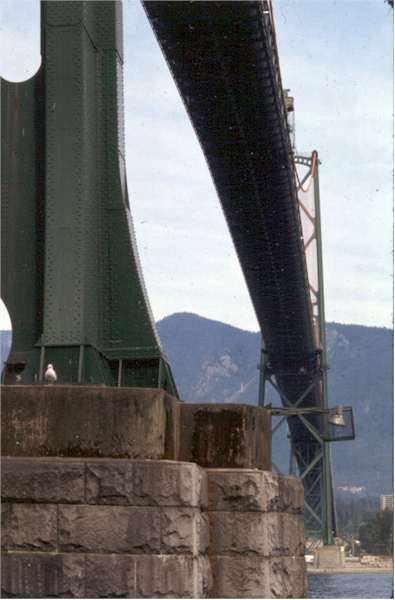 In 2002 a drawn-out rehabilitation project was finally completed with all components, other than the two towers and the main support cables, having been replaced. 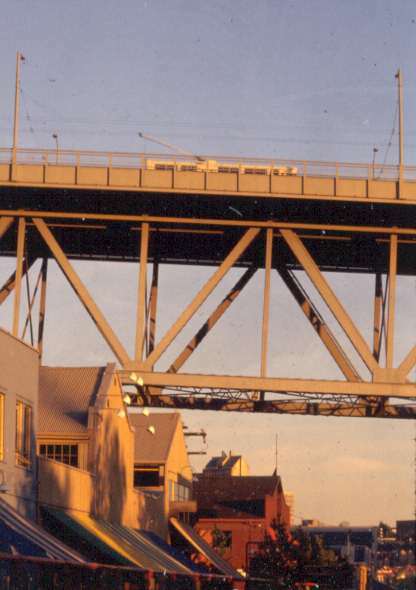 This includes the entire deck superstructure. 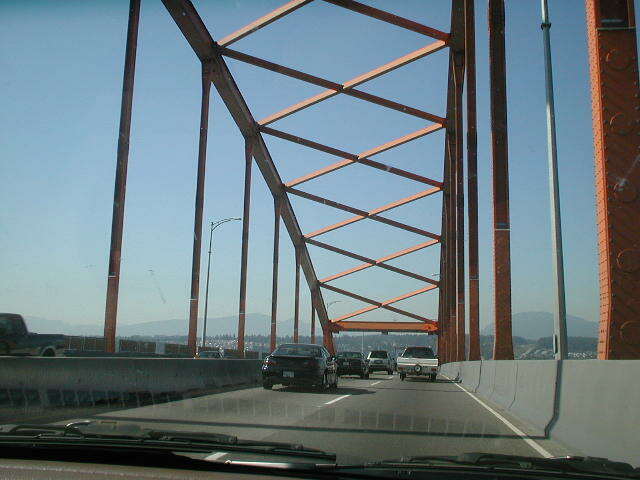 The net result is smoother traffic flow along wider lanes, although the total remains at three. 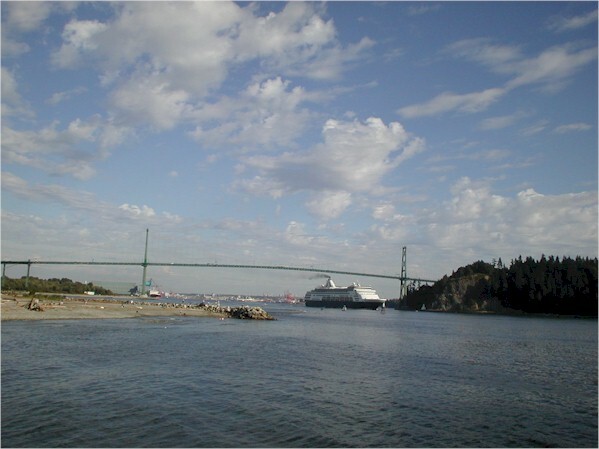 Shots of the full bridge in this collection are taken from West Vancouver's Ambleside Park. 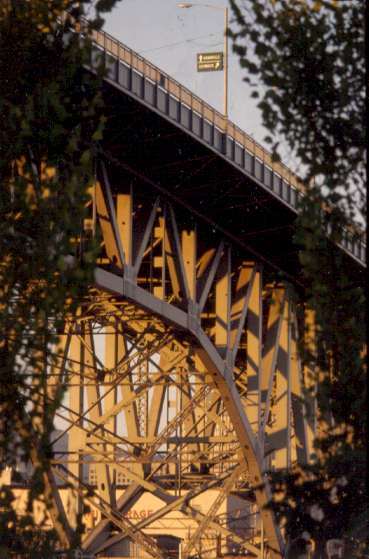 This graceful arch structure opened in July 2002. 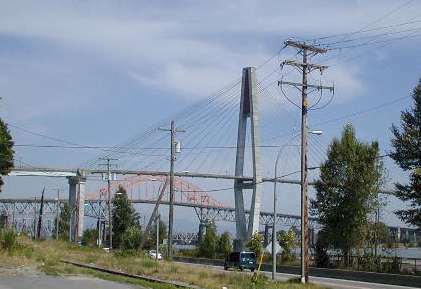 It crosses the busy Mary Hill Bypass, carrying pedestrians from Castle Park in the Citadel Heights residential area to riverfront developments. 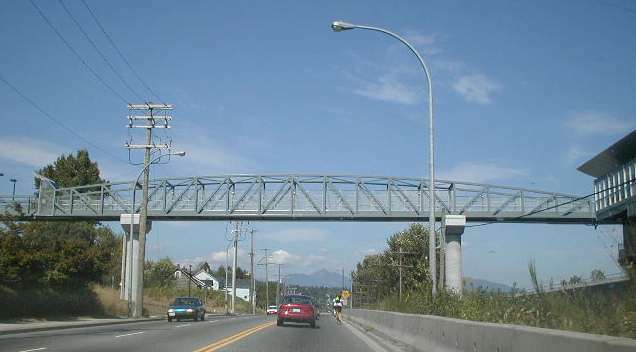 In a previous era, this portion of Mary Hill was mined for its gravel, most of it being used in the development of Vancouver International airport in 1968. 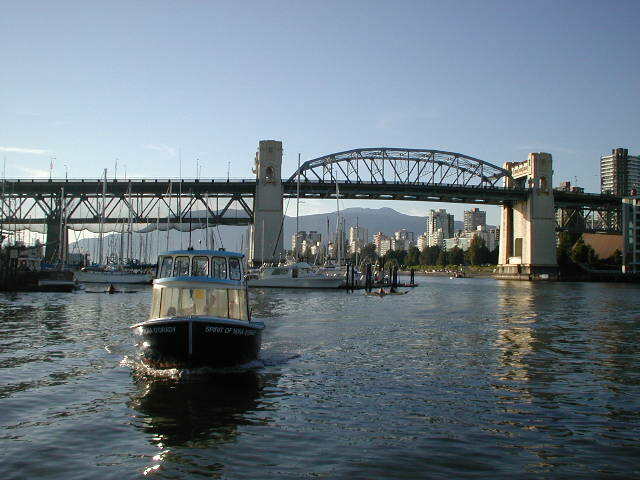 Although not in Vancouver, this entrancing bascule-type bridge is located in the provincial capital. 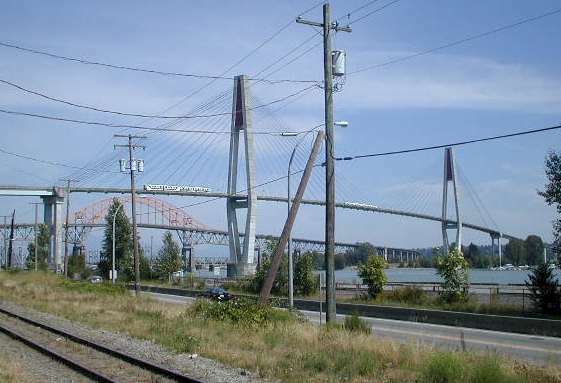 The bridge consists of two separate spans, one for road traffic, the other for the nearby terminus of the venerable E & N (Esquimalt and Nanaimo) Railway. 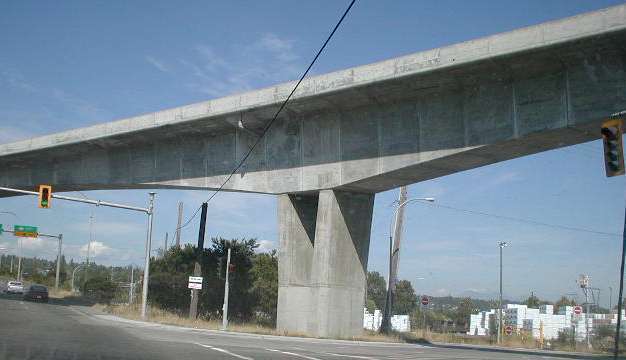 This isn't a bridge that is easily defined. 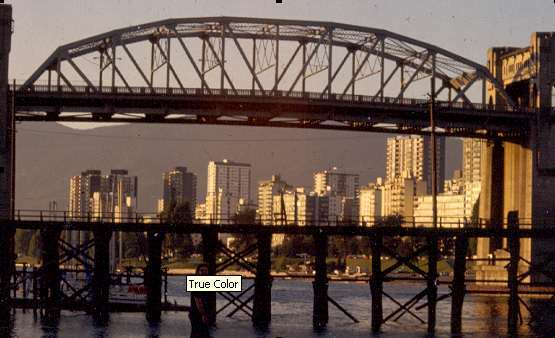 Although these photographs were taken in 1981 precious little has changed here. 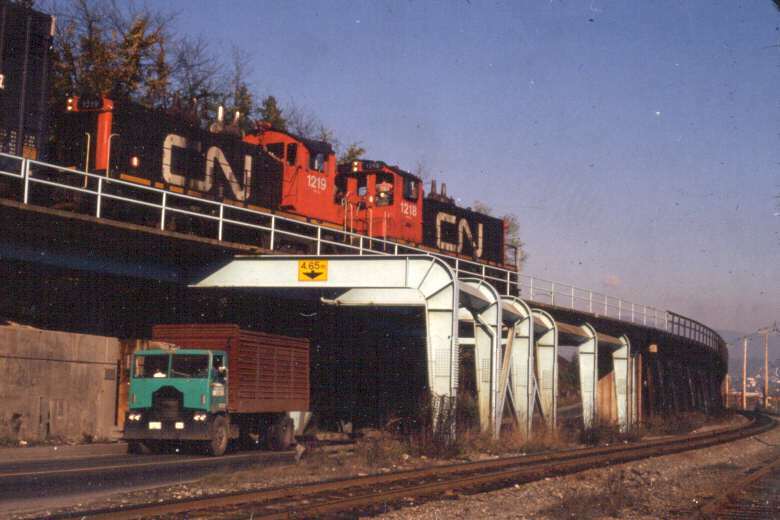 The track is used by Canadian National Railways and by Burlington Northern Santa Fe (BNSF), the only railway still using cabooses in this part of Canada. 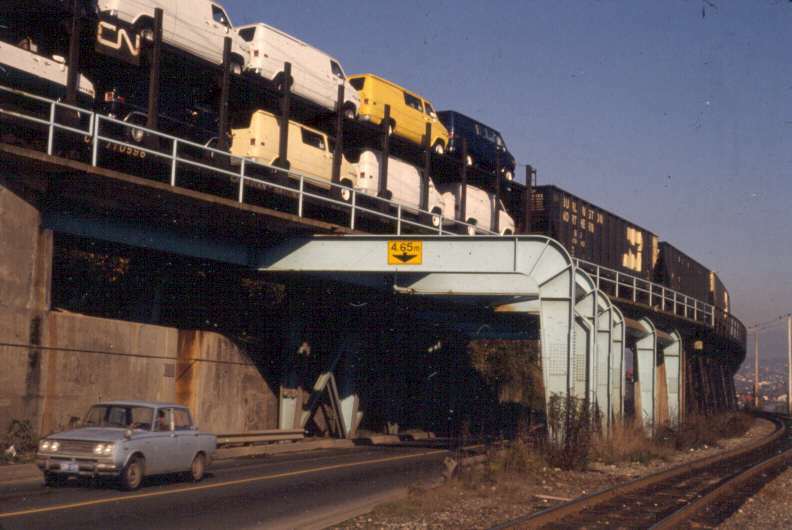 Because of vandalism, open car vehicle transporters such as those shown here have all been replaced by enclosed cars. 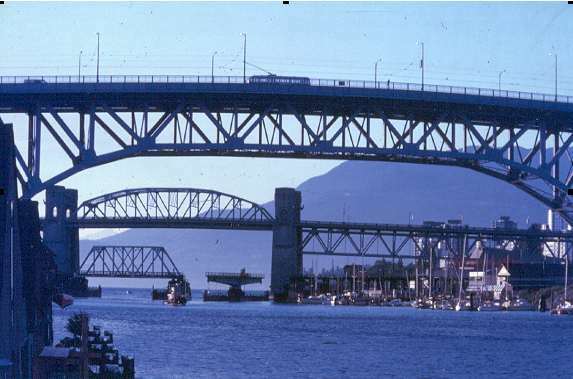 This 1981 photograph shows the CPR mainline where it crosses the Coquitlam River. 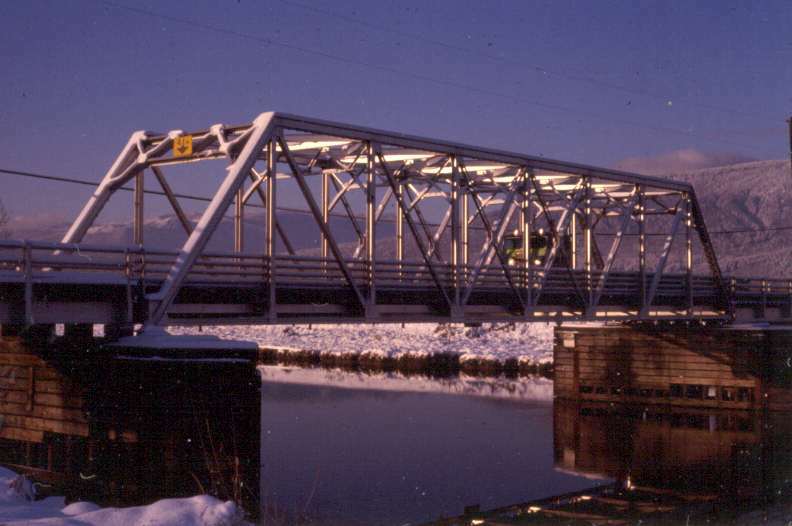 The vehicular bridge on the right has now been replaced by a concrete beam structure. 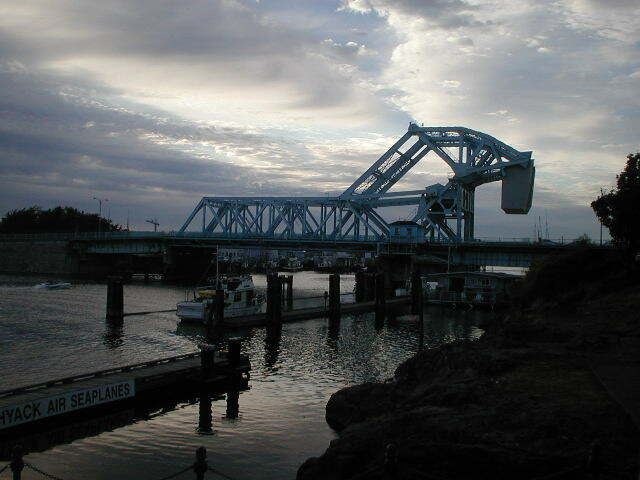 The train bridge has had a box girder bridge attached to the left to carry the West Coast Express, a commuter train. 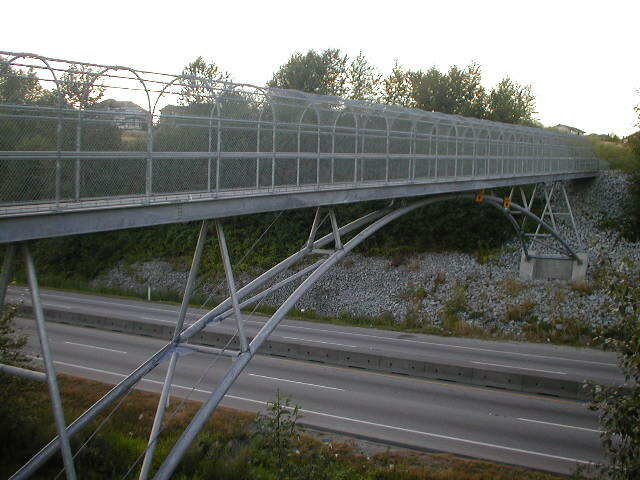 This bridge was destroyed by an impaired driver whose vehicle damaged one of the "x" members. 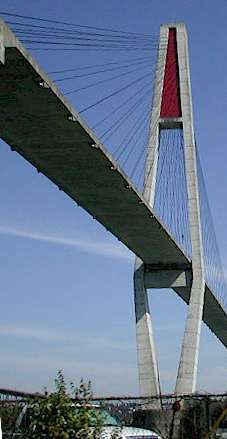 The new "Red Bridge" is a four-lane concrete structure. 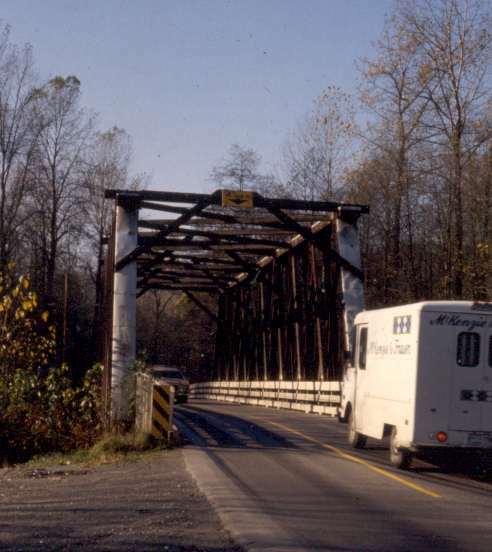 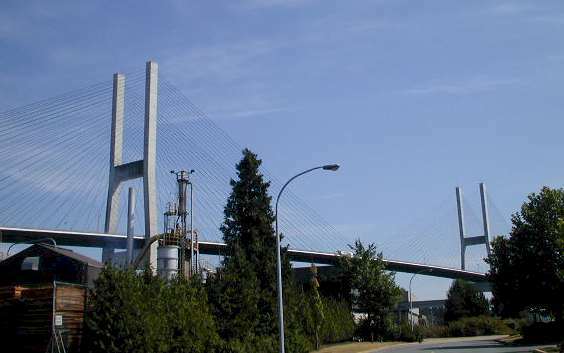 Generally considered to be the most dangerous bridge in the lower Fraser Valley, not because of its structure but because of the narrow lanes and the lack of a separator or barrier between the facing lanes. 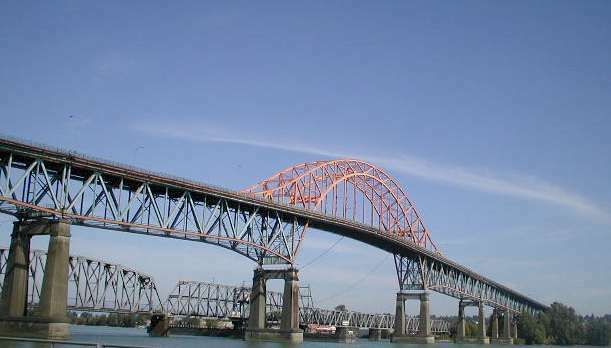 Named after a former premier of the province. 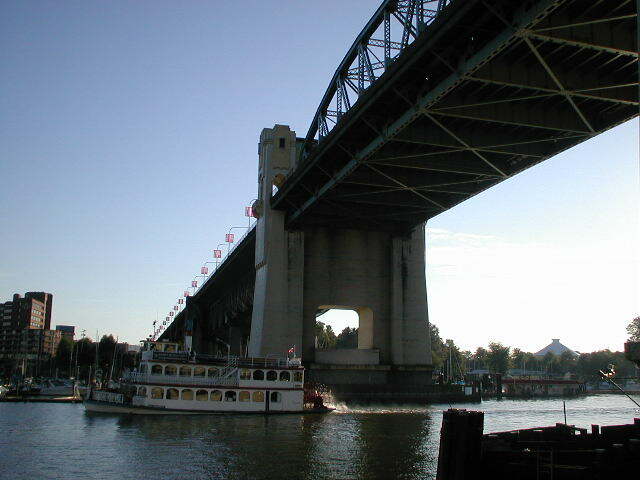 To the left, or upstream, is the CN/Burlington Northern railway bridge with its swing centre. 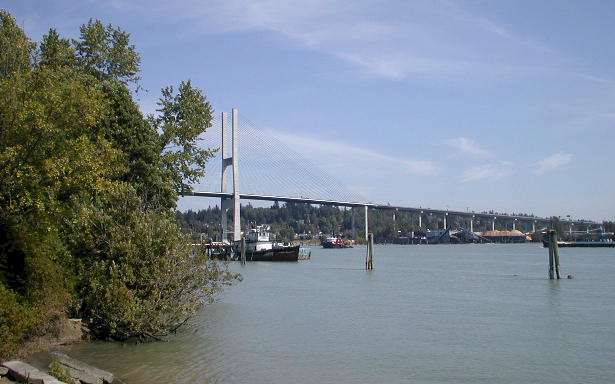 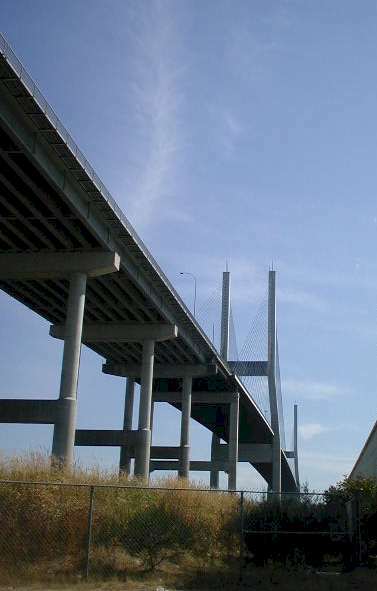 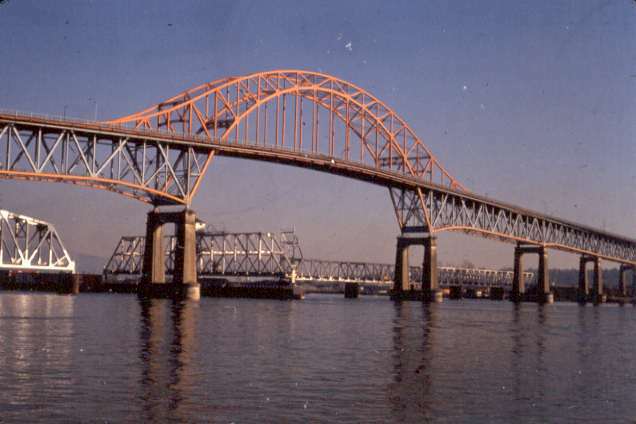 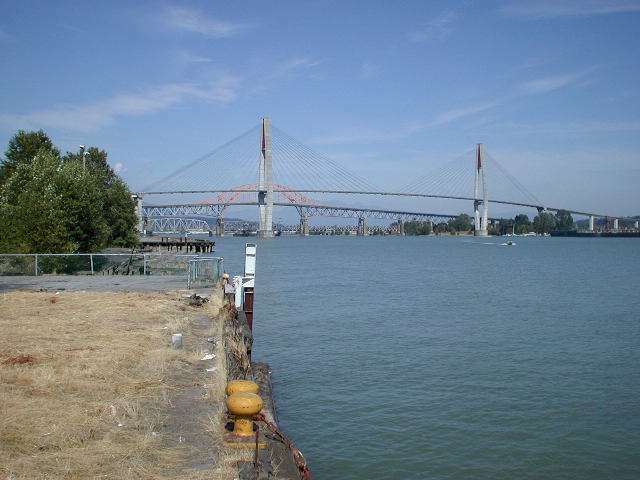 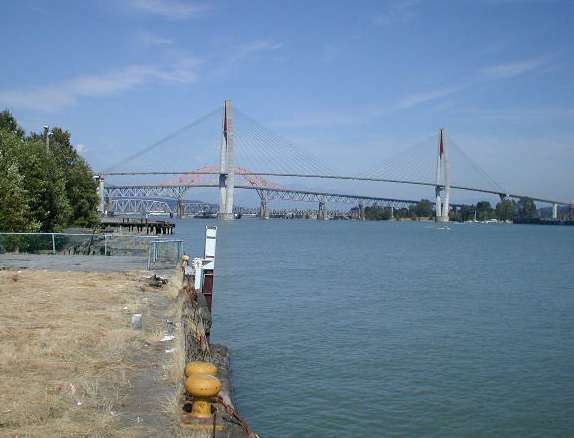 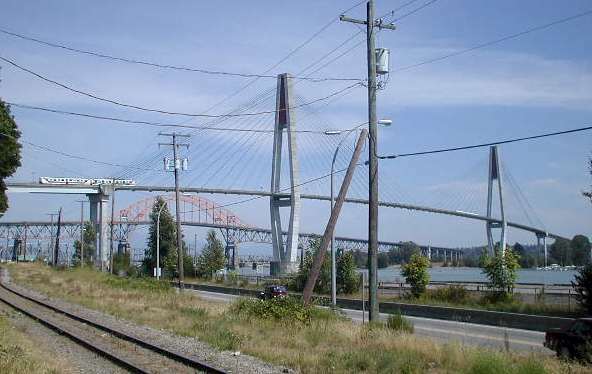 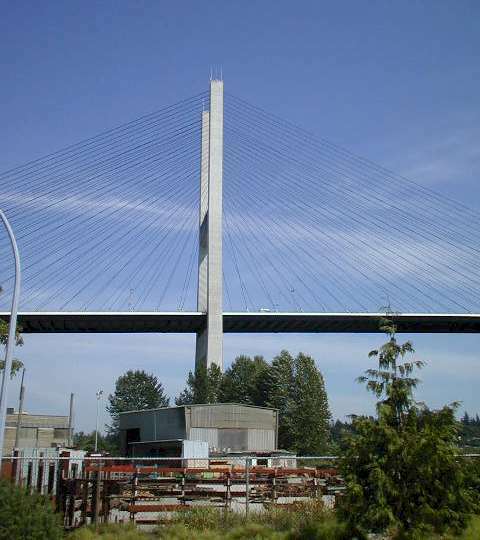 In 1986 a cable stayed bridge was built slightly downstream to carry Skytrain, this region's form of rapid transit from New Westminster to Surrey. 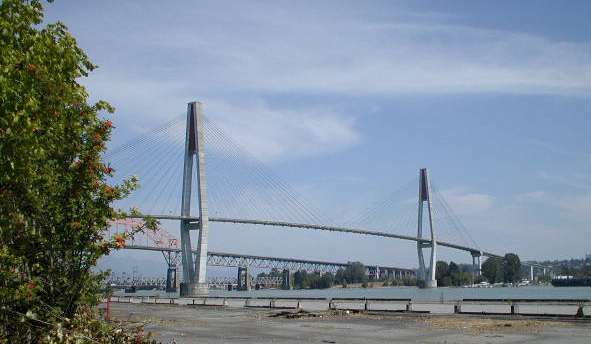 This particularly graceful cable-stayed bridge was built in 1986 for Skytrain, the rapid transit project that opened for Expo 86. 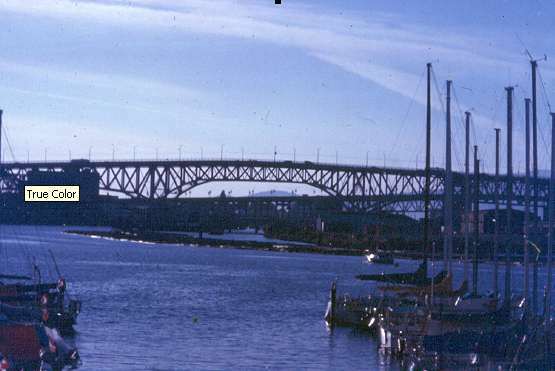 Unless indicated as otherwise, all images on this page are copyright 1981-, Peter. 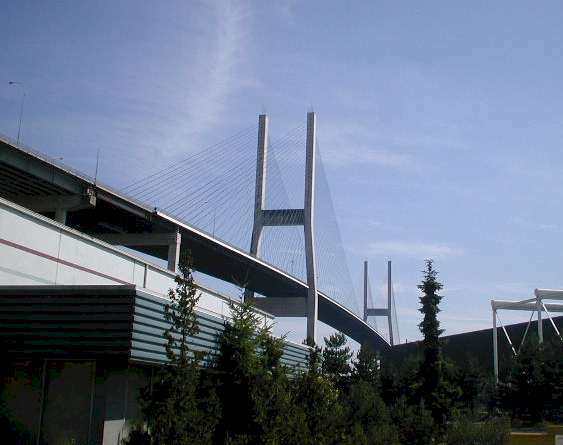 L. Vogel. 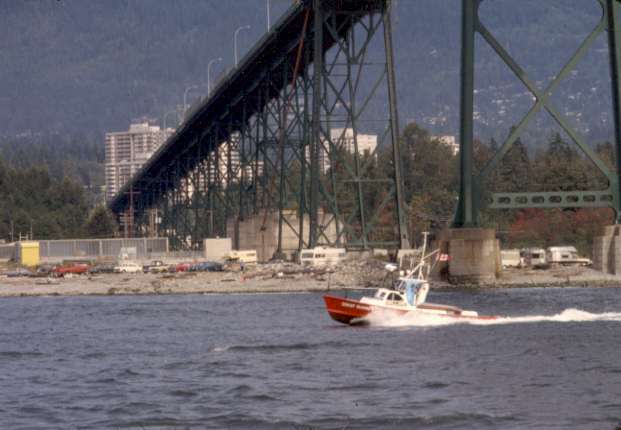 Photographs were either taken digitally (Espon PhotoPC 600, Epson 850, Canon S40 or with slide film (Canon AE-1 with Kodachrome, slides scanned). 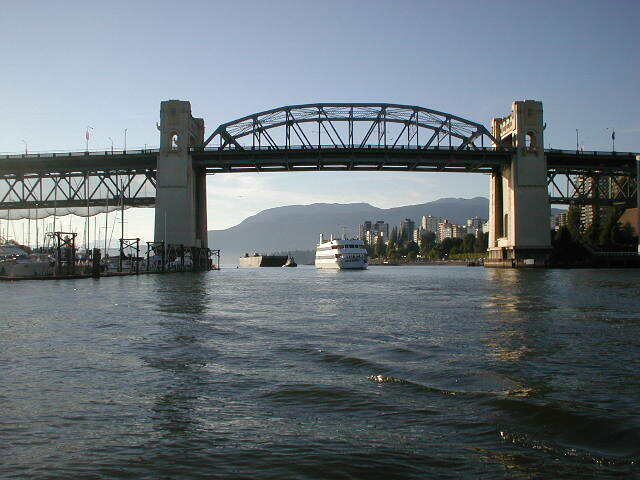 visits since August 14 2002.